The UK government has begun lifting the recent restriction on electronics in cabin baggage that were imposed on inbound flights from the Egyptian Red Sea airports at Hurghada and Marsa Alam. Passengers will now be able to carry cameras, laptops and other electronic items in the cabin as was the case prior to 28 July 2017. Inon has formally released the full details and specifications of their new Z330 strobe. Featuring a guide number of 33 and a native coverage of 110°, it also has a rapid quench time, an integrated heat sync, 220 lumen focus light aligned to strobe output and a redesigned control interface. 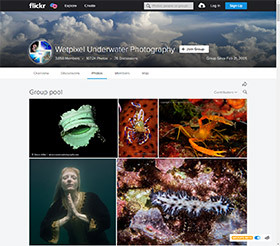 There is an active thread about the Z330 in the Wetpixel forum, and Wetpixel are currently evaluating the strobes too. In a ceremony, community officials from the villages of Pam, Saukabu, and Saupapir in the Fam (locally Pam) Archipelago of Raja Ampat signed an agreement to protect their waters with the provision of a Marine Protected Area (MPA). This agreement will now move forward through the legal process. Thereafter, the MPA can be formally declared and join the other 5 that are already established within Raja Ampat. Adobe has announced the release of Lightroom update version 6.14. This will be the last release of the perpetual version of the app. The new version adds new camera and lens support and fixes some bugs, but does not add any new features. In future, Adobe recommends that photographers convert their files to DNG if support for forthcoming cameras is not available. Bureo is a company based in Chile that makes products from 100% recycled fishing nets. Products include Ocean Jenga, a frisbee (a collaboration with Jack Johnson), and a skateboard. Bureo also sells a surfboard fin that brings awareness to the plight of sharks and donates a percentage of proceeds towards anti shark finning activism. The recycled material is known as Netplus and the fishing net recycling program in Chile is called Net Positiva. Wishing the Wetpixel community the very best and happiest of holidays for 2017. For those that exchange gifts, we hope that you get the imaging tools that your hearts desire, for those that celebrate with family and friends, may they be merry and for those that will be underwater over the holidays, we hope that your dives will be enjoyable and productive!